Where lightness is at home. All the purity of water Plose delivered directly to your house in practical and environmentally friendly returnable glass bottles. Available in Natural, Sparkling and Medium variations to satisfy everyone in the family. Dedicated to those who lead a genuine lifestyle, Plose Classic is the format that brings the goodness of uncontaminated nature to your home in each sip. In a practical and ecologically-sound returnable bottle, it is available in Natural, Sparkling, and Medium variety one-liter bottles and Still and Sparkling half-liter bottles that come directly to your home. Ask your local distributor for a delivery on the "Find Plose" section of our website. For those who prefer non-returnable bottle, there is also Easy Box. The purity of the Dolomites at home. From the high altitude to the cuisine at the top. A gem of nature designed to beautify the tables of the finest restaurants. 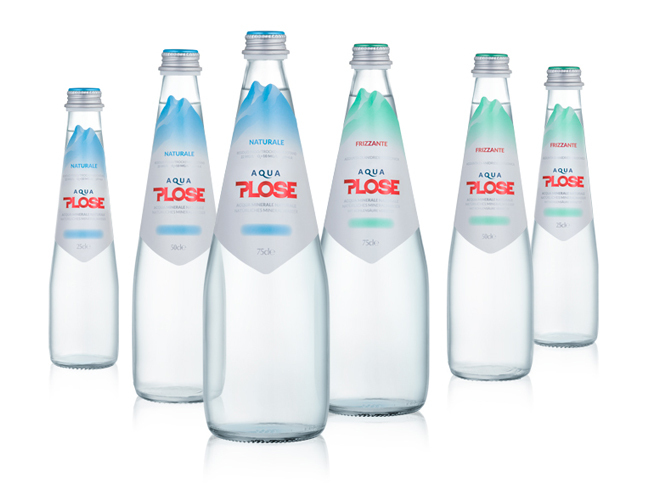 Plose Gourmet offers the crystal clear taste of lightness at first glance, thanks to a design that alludes to its super-fine taste. A choice that perfectly complements traditional and international cuisine on the basis of its perfectly neutral taste that enhances the flavors of the best recipes without masking their flavor. The quality of Plose water is always the same in every size and packaging. We cannot improve it because it comes perfect as it is, but we can preserve it more effectively and deliver it to you intact, pure and in the most suitable format for your needs. Its valuable properties are in fact well-known on the tables around the world, including those in some of the most celebrated restaurants. Gourmet 75cl, 50cl and 25cl are intended for this particular environment. A fresh and elegant look that accompanies the pleasure throughout the meal comes from having an excellent water in the center of your dining table. On the palate, its softness and lightness perfectly blend with the best traditional and international cuisine, enhancing the flavors and accompanying great wines with its neutral harmony. A feast for the eyes. A treat for the palate. An elegant bottle with an unmistakable Italian style to preserve all the purity of South Tyrol. A distinctive choice for classy restaurants with a distinctive design to enhance the visual sensation of taste. A perfect match for dishes of traditional and international cuisine thanks to its balanced neutral taste that enhances the flavors of the best recipes without masking them. In the best restaurants, presentation is the key to success. The attention to detail and the visual satisfaction comes even before the taste. The same goes for beverages. The feeling of exclusivity and prestige of a water can be communicated by its style and by its presentation. This is the idea behind Plose Luxury Edition. A high-class suit to dress some of the best water in the world. A minimalist design and refined label accented with hints of opulent gold and silver enhances the innate purity and elegance of our water. The distinctive choice for establishments with class. Plose water where you want it, when you want it. These six one-liter glass bottles are housed in an environmentally-friendly cardboard box that is practical, lightweight, and fully recyclable. A pure ready-to-drink choice that can be found in all the best health food stores. Easy Box is the Plose water format that you can find on the shelves of natural and organic food stores. A package designed for easy transport, dedicated to those who want to have a comfortable reserve of Plose water available. Easy Box respects nature, because it is packaged in environmentally-friendly cardboard, lightweight, and fully recyclable containing six one-liter returnable glass bottles. Plose Vintage soft drinks. Born from the fantastic pairing of the pure Dolomites with Mediterranean citrus.